Sala, 28, was flying from France to join his new club, Premier League side Cardiff City, when the light aircraft disappeared on Jan. 21 north of the island of Guernsey. 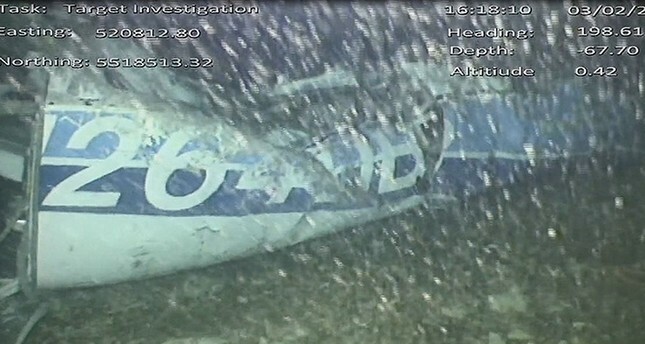 The AAIB also released a grainy image showing a part of the fuselage with the aircraft registration. The depth indicated on the image was 67.7 meters (222 feet). Sala's father Horacio earlier spoke of his shock that the plane had been found, after a private search organized by the family. Sala was traveling in the Piper PA-46 Malibu plane after transferring from French team Nantes in a 17 million euro ($19.3 million) move -- a record deal for the Welsh team. It vanished from radar around 20 kilometers (12 miles) north of Guernsey, with British pilot David Ibbotson the only other person aboard. Program notes, penned by owner Vincent Tan and the rest of the Bluebirds' board, said events had shaken "Cardiff City to its very core" and that they were now playing for Sala and pilot Ibbotson. There were a series of heartfelt tributes before kick-off, with Sala's photograph appearing on the front cover of the matchday program and the two captains laid floral tributes on the halfway line before what the club called a "silent reflection." Sala's name, in the Argentina colors, was also spelled out behind one of the goals as supporters held cards aloft.